Eclectic fun and/or interesting stuff. In case you missed it on the home page, here's a running list of my favorite quotes. You can just about live by these! Here are some amusing, tongue-in-cheek, scientific explanations for things we all experience but can't really explain. I'm a science teacher and even I'm convinced! Do you say grace before a meal? Here are some funny ways to say grace. A poem written on a particularly boring day at a job I used to have back in the 80's...boy am I glad I don't work there anymore! Here is an amusing poem about losing something. I sure hope I never get this bad! Use this pattern to make your own paper helicopter. Great for a science class lesson, youth activity or just something to keep bored kids busy for a while. Some really challenging tongue twisters, good luck with these! Think you're good at seek-and-find pictures? Then play a little game we like to call Find The Goat. Here's a real-life "What's wrong with this picture?" Bored kids? Check out the digital camera scavenger hunt activity. Check out the humor on the Inspiration Corner page. See some amazing, naturally-occurring images discovered in woodgrain. We call it the "Grainy Gallery." None of these are fake, even though it can be hard to believe that they weren't done on purpose! Here is an audio clip of Miss Teen South Carolina proving that beauty and brains don't necessarily go together...oooyyy! I had a very good friend in high school, Joe J. Thomas, who was was a total nut job! Well, now he's all grown up, doing work in advertising and is apparently still a nut job! Check out these hilarious radio commercials Joe did for one of my favorite restaurants, Friendly's. Joe did both the narration and the funny voices. Here is a very funny clip of Joe J. Thomas doing a bit about conserving gravity. Learn what to do if you are attacked, assaulted or robbed. This is serious information (no humor here). This MP3 file is a hilarious comedy routine about wisdom from the Old Folk's Home, presented by Ellie Lofaro. Clip taken from the Focus On The Family podcast. This is a really great podcast so please check it out. A very funny bit in mp3 format from the guys at Car Talk about funny errors actually found on job resumes. Car Talk is a really great show and they have a free podcast. Even if you don't care about cars, the show is hilarious. Check it out! If you hate dealing with those automated answering systems when you call a corporate phone number, I think you'll find this audio clip very amusing. Here also is the written transcript, but PLEASE listen to the audio version first. It's A LOT funnier. 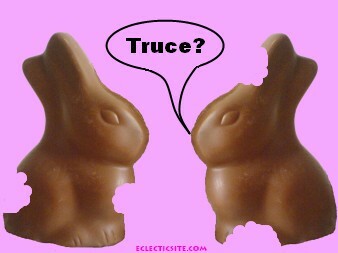 Here is some of my twisted humor left over from the Easter holiday. Esoteric Jokes. Here's a bunch of jokes that most people wouldn't even understand. Give it a try and see how many you get. If you have an original work, activity, funny or article that you would like to have considered for the Anything Goes Page, please contact me. If you own the copyright to anything found here and you feel I am in violation of copyright law, just let me know and I will remove it immediately. This software is all virus free, adware free and malware free. I wrote it all myself and put it on my website for the sake of content. Some of these programs will only run on computers that can run the .Net framework (most newer computers can). You can always just try it and see. The worst that has ever happened is that the program just won't run. If your computer does not have the .Net framework and you know what you're doing, you can always try installing it yourself with dot net fix. There was also a Vista compatibility issue with the programs I created using GameMaker. I think I have the problem corrected. I don't have Vista to test the programs on, so if you have problems or success with running the programs on a Vista machine, please let me know. All programs are being made available for personal, private use only and may not be bundled, sold or altered in any way. All of this software is copyrighted and all rights are reserved. 1. Right-click on the link for the program you want and select "Save Target" or "Save Link." If you do download and try out any of this software, PLEASE drop me a quick note just to let me know. It encourages me a lot! Pummel is a simple little game I created using GameMaker. You set the angle and power on your cannon and then fire a cannon ball at your opponent. If you hit, you win. If you miss, then your opponent gets the opportunity to shoot back. Play continues until one of the players manages to hit the other. Saucer Shoot is a very basic shoot-em-up game with an outer space theme. I created this program in order to practice using the basics of GameMaker. Don't expect anything professional, but it is a fun little game...especially for free. Alarm Clock is a utility type program I created using GameMaker. It works just like a regular alarm clock. You set the time for it to go off, and it will either sound tones or play a music CD depending upon how you have it set. I use it to limit my screen time or to remind me of appointments. Body Mass Calculator figures out what your body mass index (BMI) is based upon your weight, height and gender. It then tells you into which category you fall and your overall risk for weight related diseases. Even though I used Health Department guidelines, it still seems to me that the calculation for "ideal healthy weight" is a bit on the skinny side, but it's just for fun anyway. Tile Flip is a somewhat addicting game that presents a pattern for you to match, or scrambles the board for you to clear. You play by flipping the blue and white tiles on the bottom window. Each time you click to flip a tile, any tiles touching it also flip. You can set the difficulty level from 1 to 6. 1 is pathetically easy, and anything over 3 can be rather challenging. Tile Flip was created using GameMaker. QuickCalendar is a tiny little utility that just places a little MS Windows calendar on your desktop for quick reference. Allows you to quickly and easily change the month and/or year. Pretty basic, but I do use it from time to time. Soroban is a GameMaker program I created when I was trying to teach myself the Japanese abacus called the soroban. This is not a game, it is just a simple little virtual Japanese abacus, or soroban, on which to practice. If anyone needs free software for a virtual abacus, or soroban, here it is. If you're not interested in learning the soroban, this program will bore you to tears. A duck goes into a pharmacy and says "Give me some Chapstick and put it on my bill." I first heard this on an episode of the old TV show "Night Court." That was a long time ago but, come on, admit it, it's still funny! DealNews.com offers up-to-the-minute, great deals on electronics and electronics-related products. You'll find some unbelievable deals here. Here's a site where you can download and print free calendars in PDF format. Here's a free, online way to combine PDF files into one document. Try McAfee SiteAdvisor if you want to have extra protection and advantage when you search. It's free and I personally would hate to be without it. Translate your name into Japanese characters. How long would it take someone using a PC to crack your password? Use this link to test passwords and find out.